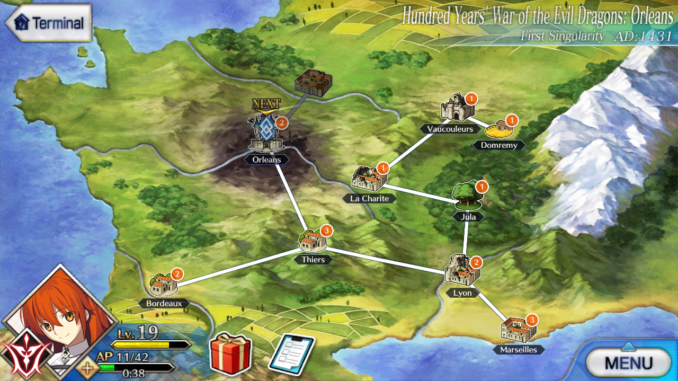 This article contains all the walkthroughs in regards to the Hundred Years' War of the Evil Dragons: Orleans in Fate Grand Order [FGO]. This will also have some tips and tricks on how to get through this part of the game. This article contains all the walkthroughs in regards to the Hundred Years’ War of the Evil Dragons: Orleans in Fate Grand Order [FGO]. This will also have some tips and tricks on how to get through this part of the game. If you’re looking for the main quest line directory, click here. After finishing the Flame Contaminated City of Fuyuki, the protagonist leaves and embarks on a new mission. Now an agent of the Grand Order Mission, the protagonist finds himself/herself in the land of Orleans. Despite saving Orleans from imminent destruction, the protagonist must return to ensure that Orleans remains safe and sound. Since majority of the enemies will be of the Rider class, bring along an Assassin class servant. Have your servants at level 40+ at least.